Report of MO Georgia - on the activities of the Georgian Committee since 2000, including the establishment of the IFToMM journal "Problems of Mechanics"
The year 2009 has been a very important year for IFToMM. We have celebrated the 40-th year anniversary of IFToMM with IFToMM still growing and we have planned a strong revitalization of IFToMM activity even by stressing benefits to individuals who are affiliated to IFToMM MOs. Several conferences have received explicit sponsorship by IFToMM but still many other should be brought under the umbrella of IFToMM as being indeed activity by IFToMM Community. The important event of the 2011 IFToMM World Congress is approaching fast and great participation is expected from all around the world, not only from IFToMM affiliated individuals. Several Technical Committees have been strengthened with new Chairs and new TC members, and new programs for activity have been planned (see the minutes of the 2009 EC meeting in the IFToMM web page www.iftomm.org). More visible is the IFToMM activity, more is its significance even in other frames. More initiatives are for the IFToMM activity, more is the influence of IFToMM in technical areas and Society managements for the further development of MMS and IFToMM yet. Activity can be planned by the MOs, TCs, and PCs, through individuals’ initiatives for conferences, meetings, editorial works, teaching events. Coordination by the IFToMM Executive Council will give the necessary support towards the IFToMM mission to promote MMS in theory, practice, formation, and link to the professional activity. Thus, this is to kindly invite any individual, who is affiliated to an IFToMM MO, to plan and propose initiative to increase the IFToMM activity and its visibility. The Executive Council Regulations page	includes the policies and regulations practiced. Appendices of EC Regulations contain the necessary forms for the annual reports of the chairs of Member Organizations, Permanent Commissions and Technical Committees, as well as application forms for conferences and sponsorship; manual for awards; advice for organizing the World Congress; templates for papers in the IFToMM sponsored conferences; and student Olympiad regulations. The messages and files pertinent to the 40th celebration of IFToMM are now available from the About IFToMM page. The 2008 Proceedings of Colloquium of PC Terminology is now available from the Publications page. The webpage of TC Computational Kinematics is now hosted on the IFToMM webpage and could be accessed from the IFToMM Technical Committee Webpages page. To expand the activities of the Permanent Commission on Communications and to further improve the IFToMM webpage and Newsletter, the membership of PC Communications will be renewed in 2010. We are looking for members keen to contribute to the PC and to help with the webpage and the Newsletter (e.g., an editorial board for the Newsletter, composed of the active members of PC Communications). Interested members/volunteers could contact the Chair of PC Communications (Dr. L. Notash). In addition, I would like to invite all IFToMM officers and representatives to provide suggestions regarding the webpage and Newsletter, e.g., other information and material they would like to be available; how the webpage and the Newsletter could be more appealing to younger researchers (e.g., posting articles on the historical development and applications of mechanisms and machines; posting software codes for modelling/analyzing mechanisms and machines, …); how to encourage the IFToMM community for contributions to the Newsletter; and so on. If your Member Organization, Permanent Commission or Technical Committee (MO, PC, TC) has recently developed a webpage or changed the URL for their webpage, please email me the pertinent information and I will post or update them on the Links page. In addition, if your MO, PC, or TC is organizing a conference and/or workshop, please note that all the requests for posting the conference/workshop announcements on the IFToMM webpage should be approved by the IFToMM Executive Council. The list of requests is generally discussed and approved during the annual EC meeting, so please submit your applications as early as possible. The sponsorship application form for the conferences and workshops is available from the Conferences and Sponsorship page of the IFToMM webpage. Professor James Trevelyan, a member of IFToMM EC, has been continuing his contributions to the IFToMM webpage by maintaining the database he created for the IFToMM officers and members in 2006. The latest version of all officers and members (affiliations, contact info with emails protected, and photos) are available from the IFToMM page. As an IFToMM officer, if your photo is not included there please forward a head and shoulders photo to Dr. Trevelyan. I thank all IFToMM officers who contributed to this issue of the IFToMM Newsletter, and I would like to invite all members of PCs and TCs for contributions to the 2010 issue (as a WORD document or in PDF format). The contributions could relate to any aspects of mechanism and machine science, e.g., historical development and applications of machines/mechanisms (interesting mechanisms and/or their interesting applications). Please note that the contributions are published in any of the four IFToMM official languages, English, French, German, and Russian. Contributions submitted in official languages other than English are expected to be accompanied by an English abstract. 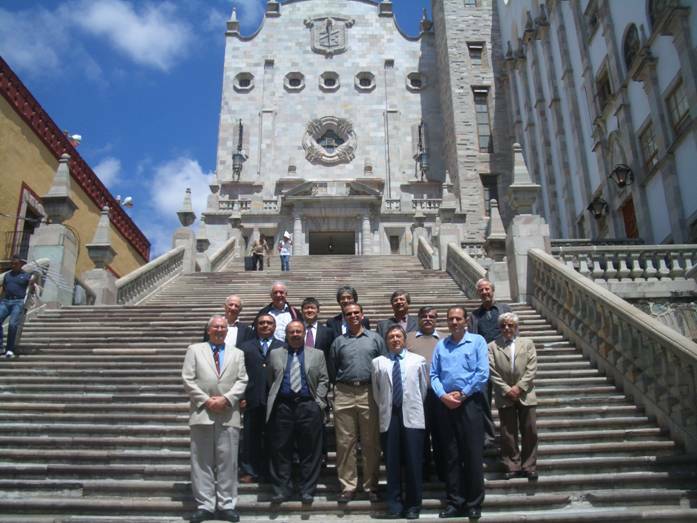 The 42nd IFToMM Executive Council Meeting was held in Guanajuato, México, on the 30th of September and the 1st of October, 2009 , at Universidad de Guanajuato, Guanajuato, México, the site of the 13th IFToMM World Congress. The status and problems of IFToMM activity were discussed resulting in a full agenda. Many of the main points of discussion were related to the President’s reports and proposals for improving IFToMM activity, leading to give more visibility and activity worldwide to the Federation, as well as additional funds. Activities by Permanent Commissions (PCs) and Technical Committees (TCs), reports of the EC Working Groups (WGs), the Treasurer’s report, the report of the Organizing Committee for the 13th IFToMM World Congress, and the invitation for the next EC meeting were also presented and discussed. After voting, some reports of the PCs and TCs were approved, provisionally approved, or rejected. Reports provisionally approved were those from new Chairs appointed lately or what the EC considered incomplete. Unfortunately, the report of the TC for Nonlinear Oscillations was rejected, and from the TC Chair for Gearing was not received. The Secretary General Prof. López-Cajún reported on the business and correspondence of IFToMM. In particular, he managed several email postal ballots among the EC members, namely, for appointing Prof. Prof. Juan Carlos García-Prada as Chair of the PC for Education, Profs. Doina Pisla, Karol Miller, Chairs of the TCs for Computational Kinematics and Human-Machine Systems, respectively, and also for the updated of the MoU with the editor of Problems of Mechanics Jnl. These matters required decisions and actions before the annual meeting. He also reported as Chair of three WGs. Prof. Trevelyan, EC Member, presented a report pointing out the need for reinforcement of memberships rules for PCs and TCs, and also to ignore silent PC/TC members. Some of his proposals, after EC discussion, will be included in the EC Regulations. Prof. I-Ming Chen was appointed as Chair of the TC for Robotics. This was under Prof. Bodo Heimann who completed successfully his second period. Appointments for new members were approved for different PC/TCs. An IFToMM dedicated service award was approved for Prof. Tian Huang, China-Beijing and an IFToMM award of merit was approved for Prof. Florea Dudiza, Romania. The awards were given to the recipients by the President during the IFToMM sponsored conference SYROM09 in Brasov, Romania, on 14-17 October 2009. Most of the Working Groups (WGs) were closed because they completed the tasks assigned. Nevertheless, two new WGs will be working on the Mechanism Olympiad, and for the role of MMS in technology development, together with the Federación IBeroamericana de Ingeniería Mecánica (FEIBIM). Twelve events from different MOs and others were approved as IFToMM sponsored conferences by the EC for IFToMM patronage. The Treasurer’s report detailed the financial status of IFToMM by stressing still some problems that are related to arrears due to some member organizations. Several duties related to budget allocations were asked to be planned by the Treasurer. Young Delegate Program was reinforced with 10 grants for the year 2010 and additional budget has been allocated to it for the IFToMM World Congress 2011. Prof. Ricardo Chicurel Uziel, Chair of the Mexican Organizing Committee (MOC) for the 13th IFToMM World Congress, presented his report on the organization and Call for Papers for a successful congress. On the 1st of October there was a visit to the facilities offered by the University of Guanajuato (UG) for the World Congress. There were some recommendations about several issues that the MOC will have to comply, but in general the facilities were considered adequate for the conference venue. On behalf of the EC, as a token of appreciation, Prof. Ceccarelli gave an IFToMM Service Certification to Prof. Arturo Lara-López, Rector of UG, and his team for their support. The next meeting of the IFToMM Executive Council will be held in Sousse, Tunisia, from the 10th to the 14th of November 2010. After the EC meeting, on the 30th of September, the ceremony for celebrating IFToMM 40th Anniversary took place. The records of this will be available at the IFToMM webpage. A ceremony has been scheduled in Zakopane, Poland, the birth city of IFToMM in 1969, on January 26, 2010 to donate a bronze plaque to the city to commemorate the foundation of IFToMM on September 27, 1969. The minutes of the 42nd EC meeting and the corresponding appendices are available for public consultation on the IFToMM webpage www.iftomm.org. EC Members, Chair of TC for Transportation machinery, and the Mexican delegation with Prof. Chicurel, host of the 42nd IFToMM EC meeting in Guanajuato, Mexico. The 13th IFToMM World Congress will take place in the city of Guanajuato, Mexico, on June 19 - 25, 2011. This congress is held every 4 years and it is the largest conference for mechanism and machine science as organized by the IFToMM community. The aim of the congress is to gather researchers, scholars, practitioners and students with interests in the general area of the theory and practice of machines and mechanisms. Papers are welcome on the general areas of the theory and practice of machines and mechanisms, with particular reference to the topics of the IFToMM Technical Committees and Permanent Commissions. IFToMM Young Delegate Program will provide grants for support to young researchers as ruled in IFToMM webpage. Local Organizing Committee will provide additional support upon request and available specific funds.